ALLEN PARK — Louis Delmas saw limited action in Lions practice Tuesday after sitting out on Monday. It’s not a big deal for the safety who is coming off knee surgery in the offseason. It’s a precautionary move. Missing from Tuesday’s first full-padded practice was Jahvid Best who said he is symptom-free from his concussion, but has not been cleared to play. Also out were S Erik Coleman (groin), S Jacob Lacey who banged his knee Tuesday, and Jeff Backus who is wearing a hard cast on his right hand after injuring his thumb. Jason Fox and Corey Hilliard took most of the snaps replacing Backus at left tackle. The players have Wednesday as a day off. On Thursday NFL commissioner Roger Goodell is expected to visit. ALLEN PARK — Since his ACL surgery on Nov. 21, rookie wide receiver Ryan Broyles has been working hard to get back on the football field. 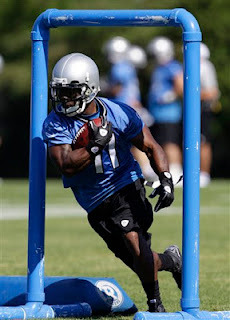 It happened on Sunday, when he was taken off the Physically Unable to Perform list and joined his Lions’ teammates for practice. He wasn’t quite ready when he took his turn and lined up for a one-on-one drill (wide receiver vs. defensive back) and he heard it from coach Jim Schwartz loud and clear. Actually so did the fans. It was kind of Broyles’ welcome albeit a tough-love one from Schwartz. “That’s a part of football, you love that when a coach gets on you, it means he cares, that’s a good thing,’’ said Broyles, a second-round draft pick out of Oklahoma. Since it was the team’s third practice and they were wearing shoulder pads. It was just his first and per NFL rules players cannot wear pads for their first two days of practice. “I want to be out there as much as possible, they’re going to bring me along at an even pace so whatever I can do to get out there I’m going to give it my all whatever chance I have,’’ Broyles said. ALLEN PARK — Jeff Backus was wearing a brace on his right hand after injuring his thumb at Saturday’s training camp session. He did not participate in Sunday’s practice. Mikel Leshoure, who pulled a hamstring on Saturday, did not practice either. Coach Jim Schwartz said both injuries are short-term. “I just felt it coming, no pop or nothing serious like that. I definitely wanted to be smart about it,’’ Leshoure said. He feels it had something to do with over-compensation while rehabbing from Achilles’ tendon surgery. ALLEN PARK — It wouldn’t be NFL training camp without a couple injuries. 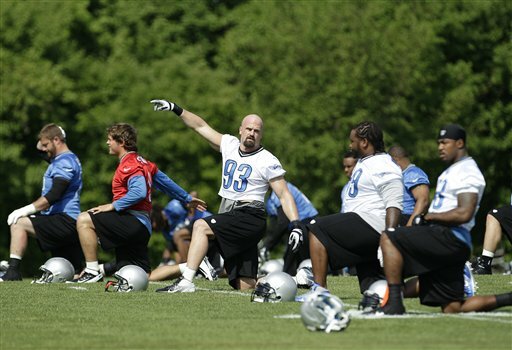 Lions left tackle Jeff Backus and running back Mikel Leshoure were sidelined during Saturday’s training camp session. Backus injured his thumb during one-on-ones and went inside for X-rays. He returned to the field, but not to action. “We’re going to wait and see. 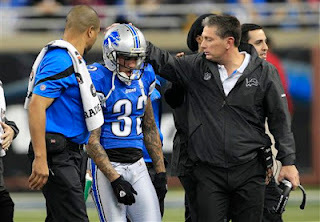 It wasn’t real determinant right away (on the X-rays), but there were some findings on it so we’ll look at it later this afternoon,’’ coach Jim Schwartz said. An offensive lineman could play with a broken thumb, but no sense to push it on second day of camp. Leshoure made it until deep in the practice when he grabbed his hamstring. Schwartz was uncertain of the severity. “I’ll be good, I’m fine, I’m straight,’’ said Leshoure who is coming off Achilles’ tendon surgery. Rookie defensive end Ronnell Lewis, who missed Friday’s opening session with a tight back, was back at work on Saturday. 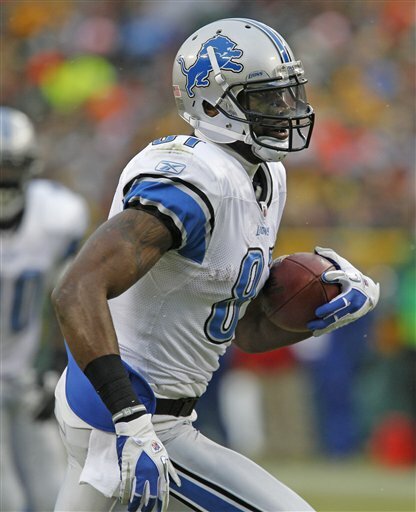 Jahvid Best, Ryan Broyles, Jonathan Scott and Chris Greenwood remained out. 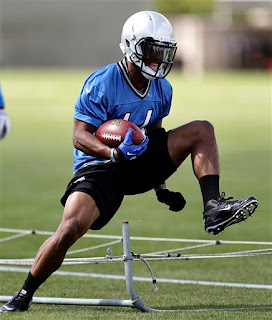 ALLEN PARK — It’s discouraging news that Lions running back Jahvid Best has been placed on the Physically Unable to Perform list before the start of training camp. It is not clear if Best, who is coming off a concussion last season, was not cleared to have contact or if the evaluations haven’t been completed. He participated in offseason drills which were non-contact. This does not mean he will miss any of the season. He’s allowed to come off PUP at any time during training camp. Best was a big medical question mark along with running backs Mikel Leshoure (coming off Achilles’ surgery) and Kevin Smith (ankle injury). Also on the PUP list are rookies Ryan Broyles, Chris Greenwood and Ronnell Lewis, along with T Jonathan Scott. ALLEN PARK — Jahvid Best, who is coming off a concussion, has not been cleared for contact yet. Coach Jim Schwartz said this morning that the decision involved a battery of tests, not just a single maneuver. With training camp starting on Friday, it seems they would have gotten this all sorted out. Best was cleared to participate in Organized Team Activities and minicamp, but both of those were non-contact. Schwartz would not rule out the possibility that he will be ready to go on Friday and would not put any odds on it either. One good thing about the Lions, is they are always cautious when it comes to returning players to the field following any kind of injury. If Best doesn’t take the field on Friday, it’s not necessarily a setback but at the same time not a good sign either. Let's talk Lions. Click here for live chat that starts at 3 p.m.
Three Lions rookies have injuries woes that will keep them off the field when training camp opens on Friday. Tuesday the Lions announced WR Ryan Broyles will start the season on the active/non-football injury list while CB Chris Greenwood (in photo) and DE Ronnell Lewis are on the active/physically unable to perform list. All three can start practicing any time, but if they are not on the 53-man roster on Sept. 3 they will have to sit out the first six games. Broyles was coming off ACL surgery from his Oklahoma playing days when he was drafted so this is not a surprise. While Broyles is expected to play a big role in the offense, there is no sense in rushing him to the field. Greenwood, the fifth-round pick from Albion College, underwent abdominal surgery after an injury during OTAs in May and is in the process of rehabilitation. Lewis’ injury has not been disclosed. Riley Reiff seemed like the kind of guy who definitely would be signed prior to the start of training camp. They all say it when they’re drafted, but some you can tell actually mean it. Reiff, the Lions’ first-round draft pick, signed a four-year $7.993 million contract on Monday. He’ll be a go when training camp opens on Friday at the Lions’ Allen Park practice facility. All rookies and injured players reported on Monday. The remaining players report on Thursday. Reiff said it was important to him to report with the rest of the rookies who have all been signed previously. “I didn’t want to miss any time. I thought it was a big part of this whole process to get it done by the time training camp started,’’ Reiff said. During rookie camp, the organized team activities and the team minicamp, Reiff lined up at left and right tackle. After all, he was a first-round pick. General manager Martin Mayhew said Reiff could be used at tackle or guard, but Reiff has not lined up at guard and said no one has spoken to him about making the move. Reiff, who made the long drive to Detroit from South Dakota, is expected to eventually take over the left tackle position from Jeff Backus who is 34. That won’t necessarily happen this season though. 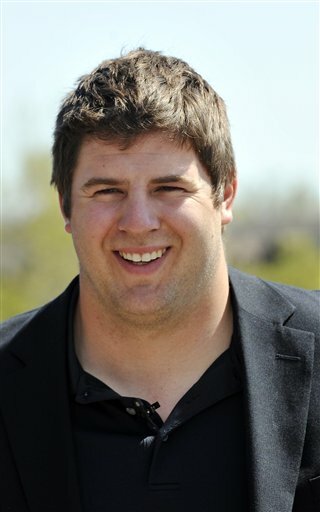 Reiff’s progress in training camp and the preseason games will determine just how he’ll be used. Possibly he could compete for the start at right tackle with Gosder Cherilus. Rookie cornerback Chris Greenwood, the fifth-round pick out of Albion, will start the season on the physically unable to perform list. Greenwood underwent surgery following a tear to a lower abdominal muscle during organized team activities in May, per a report from the Lions web site. Greenwood is rehabbing and said he’ll be back sooner rather than later. Gone now are his slim chances of earning the starting role opposite Chris Houston now that Aaron Berry has been cut. 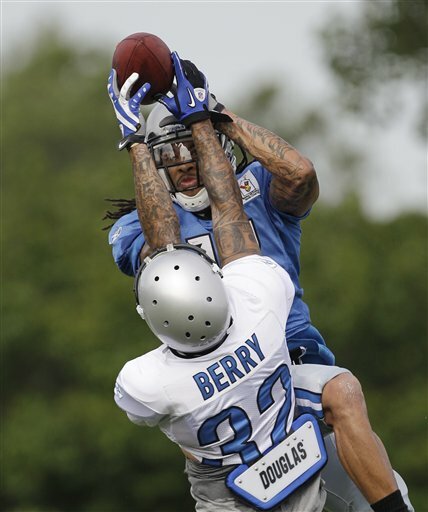 In a move to prove they are serious about personal conduct, the Lions today released cornerback Aaron Berry. It was a good decision. Enough is enough. Berry had been arrested for the second time in a month early on Saturday morning for assault which involved a firearm. On June 23 he was arrested for drunk driving. Both arrests were in Harrisburg, Pa.
“We have repeatedly stressed to everyone in our organization that there will be appropriate consequences when an expected standard of behavior is not upheld,” Lions President Tom Lewand said. Many Lions’ fans had been calling for the Lions to cut Berry and make a statement. Berry’s two arrests brought the total of arrests for Lions players to seven this offseason. Nick Fairley had two (drunk driving, marijuana possession), Mikel Leshoure had two marijuana possession charges and Johnny Culbreath was also arrested for marijuana possession. This is not a team of thugs. Just a few players have given the Lions’ a black eye. He had been signed as an undrafted free agent out of Pittsburgh in 2010. He earned a starting cornerback position as a rookie, but was injured in his first game and missed the rest of the season. He played in 11 games last season, starting in three of them until he injured his shoulder again. Berry had gained some weight this offseason hoping to establish more durability. He was projected as a starter. This move is a blow to the secondary on the eve of training camp. Now Jacob Lacey, Alphonso Smith and rookie Bill Bentley will be vying for the starting role. So with two stupid moves in less than a month, Berry threw away a chance to be an NFL starter and possibly a career. Aaron Berry added pounds and muscle in the offseason to increase his durability which has been an issue during his first two seasons as a cornerback with the Detroit Lions. That might not matter at all now. Berry, who was projected as a starting corner, was arrested Saturday for his second time in a month. This time it was for simple assault involving a firearm in Harrisburg, Pa. On June 23 he was arrested for suspicion of drunk driving, also in Harrisburg. Clearly, he could be suspended by the league if the Lions don’t take matters into their own hands. It’s the seventh arrest in the offseason for the Lions. Two for Berry, two for Nick Fairley (drunk driving and marijuana possession, two for Mikel Leshoure (both marijuana possession) and one for Johnny Culbreath (marijuana possession). Although no arrests were involved there was a locker room incident involving Titus Young punching teammate Louis Delmas. And it was revealed this week that Corey Williams was arrested for drunk driving 13 months ago during the NFL lockout. At some point, the Lions have to take a stand and release players who don’t live up to NFL standards. Will Berry be the first? It’s certainly possible. Lions’ management needs to show the fans that they hold the players accountable. Anthony Pinzone, who writes on the Miami Dolphins fan blog Phinfever.com, claims in a blog posted on Sunday that he and two buddies who were visiting Harrisburg were Berry’s victims. He wrote: “I’m visiting family in PA and was out at the bars in Harrisburg last night. At the end of the night as my buddies and I are walking back to the car we nearly get hit by this guy backing out of a parking spot. “Naturally we were yelling to get his attention so we wouldnt get hit. Well next thing we know theyre rolling down the back window and the front passenger points a laser at us and tells us to back away. He wrote that after they filled out police reports the policeman told them it was Berry, although it sounds suspicious that Berry’s name would be released. “The scariest moment in my life thus far came at the hands of a player from the sport Im most passionate about. Go figure,’’ Pinzone wrote. Berry was signed by the Lions as an undrafted free agent out of Pittsburgh. He earned the starting role as a rookie, but was injured in his first game (the Calvin Johnson game at Chicago) and missed the rest of that 2010 season. He played in 11 games last season and started in weeks 12, 13 and 14 before he injured his shoulder again. During minicamp, defensive coordinator Gunther Cunningham joked that Berry weighed 190 pounds, up from his original 115. Cunningham was excited about Berry in June, before his two arrests. Other options for the Lions at cornerback opposite Chris Houston are Alphonso Smith, Jacob Lacey, who was signed as a free agent, and three rookies — Bill Bentley (Louisiana-Lafayette), Jonte Green (New Mexico State) and Chris Greenwood (Albion). Rookies and injured players report for training camp on Monday. The remaining players report on Thursday. The first training camp session is set for Friday. The Lions are becoming a punch line because of the stupidity of a few players during the offseason. Cornerback Aaron Berry doubled down this weekend. 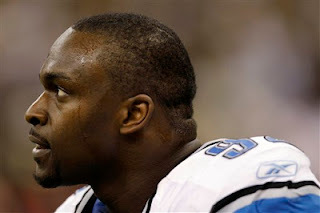 He was arrested on three counts of simple assault according to ProFootballTalk.com. A firearm was used in the incident. This is Berry’s second arrest. He was charged with suspicion of drunk driving in June. Both occurrences were in Harrisburg, Pa.
After his arrest last month, Berry should have been on his best behavior. Now he faces possible suspension from the league. Berry had a solid offseason and was projected to be a starting cornerback. His two arrests bring the total to seven for the Lions this offseason. 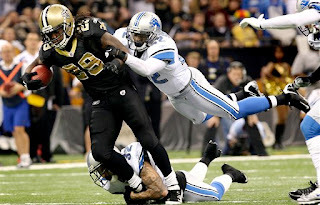 Nick Fairley twice — for marijuana possession and drunk driving; Mikel Leshoure twice for marijuana possession and Johnny Culbreath for marijuana possession. It also came to light this week that Corey Williams was arrested for drunk driving 13 months ago during the NFL lockout. On Monday rookies and injured players report for training camp. The rest of the players report on Thursday with the first session of training camp set for Friday. According to ProFootballTalk.com, Williams was in court earlier this week — 13 months after the incident — arguing that the police did hot have probable cause to pull him over. He blew a 0.10 percent blood-alcohol lever on the Breathalyzer. When Nick Fairley was arrested this spring, Williams didn't have much to say except he'd let the coaches handle it. While OTAs and minicamps are necessary, roster spots are won at training camp. Here are three veterans who could be the biggest surprises at training camp. 1. Safety Erik Coleman only played in four games last season before an ankle injury ended his season prematurely. He’s entering his ninth NFL season, but Lions fans haven’t seen the real Coleman. Even though he signed in February 2011, there was no offseason team workouts due to the lockout. He looked good at minicamp and OTAs. A healthy Coleman would be a boost to the secondary. 2. Safety Amari Spievey is playing with more confidence due to growing comfort in role as safety. He was moved from corner to safety in his rookie season. It’s a huge switch and he’s just completed his first real offseason at safety. He’s had good camp. Expectations are high. 3. 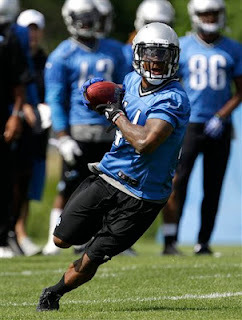 RB Jahvid Best has put foot and concussion problems behind him. He’s ran like a mad man in the offseason. Wait, a mad man might not follow the correct routes. Let’s say he was impressive. It shouldn’t be a huge surprise that he performs well, it’s just been a while since we’ve seen it consistently. 1. 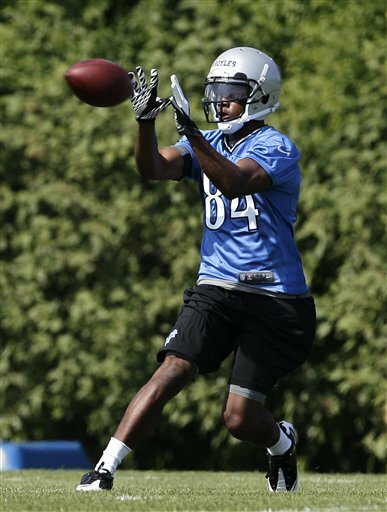 WR Ryan Broyles is still rehabbing from ACL surgery seven months ago. Wouldn’t be a surprise to see him start the season on the Physically Unable to Perform list which would keep him out of the first six games. It’s too early to tell, training camp will be his true test. When healthy he promises to be yet another offensive weapon. 2. DE Ronnell Lewis is one tough hombre. Rode bulls growing up in Dewar, Okla., and his nickname is Hammer because he can nail opposing players. He’s a lock to make the 53-man roster, might not see much time at defensive end this season, but that will come. 3. LB Travis Lewis has a chip on his shoulder because he was drafted in seventh round even though he was a four-year starter at Oklahoma and led the team in tackles all four years. His speed is the question mark here. He needs to make the roster with his special teams play. Talk to the guy for five minutes and you wouldn’t bet against him. Cris Carter did not exactly endear himself to Lions fans last fall when he left Calvin Johnson off his list of elite NFL receivers. Seems Carter, the former Vikings’ Pro Bowl wide receiver, has had a change of heart. Here are three reasons Carter is not an idiot after all. 1. He’s seen the light and he’s not afraid to admit it. 3. 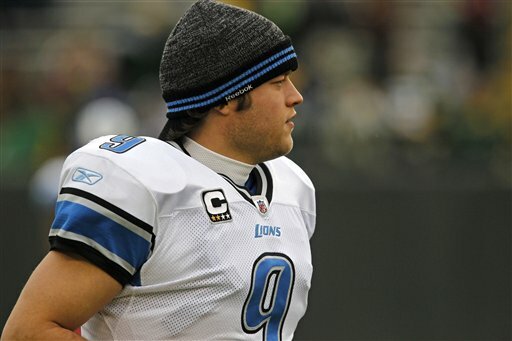 Not only did he change his mind on Johnson, but he realizes that Stafford is a special young quarterback. There may be hope for Carter after all. Special teams should never be ignored. A good special teams player can hold onto a job for a long time. Here are three (not including Jason Hanson) who could excel at special teams. 1. John Wendling, not exactly a surprise. His special teams play has kept him around although he’s starting to pick up more notice at the safety position too. 2. They don’t call Ronnell Lewis the Hammer for no reason. Apparently at Oklahoma he knocked a guy cold on a special teams play. It’s the reason this rookie defensive end is likely to make the roster. 3. Stefan Logan returns kicks, but is also strong on special teams coverage units. On top of that he can run the ball and line up as a receiver. It’s his multidimensional ability that could help him maintain a roster spot. It’s not a certainty, although he comes in cheap at $615,000 for this season. Defensive end Cliff Avril and the Lions broke off talks this afternoon for a new long-term contract. This is an unscientific poll culled from information from teammates and seeing a few of them in action on the golf course. The three Lions who are the best golfers. 1. Jason Hanson. A kicker, why not? He’s held this honor for years and years. 2. Matthew Stafford. A quarterback, why not? An all-around athlete, golf should be second-nature. 3. Shaun Hill. Saw Hill and Stafford playing during a media event at Indianwood Country Club. Hill had a blind shot about 150 yards from the green on the ninth hole and smacked it within 10 or 15 feet (I was far away so hard to tell). I yelled, “Nice shot.” He asked if it went in. At first I thought he was greedy, then realized he’s good enough to make shots that others might just dream about. Leaders don’t have to be mouthy and these three prove it. Here are the three quietest Lions. 1. Calvin Johnson — humble, quiet and polite. The perfect gentleman which makes you wonder how he got into a game like this. 2. Jason Hanson — maybe in 21 years with the Lions he’s used up his best lines. He has a million of them, and will be happy to share once you get him talking. 3. DeAndre Levy is a quiet guy in the locker room, maybe it’s because he played with Larry Foote, a Hall of Fame motor mouth, as a rookie. From what we’ve heard he has plenty to say on the field where it counts the most. So who are the Lions that roar the loudest? Here are the three biggest mouths on the team. 1. Louis Delmas. It’s not even close here. He’s the top dog. 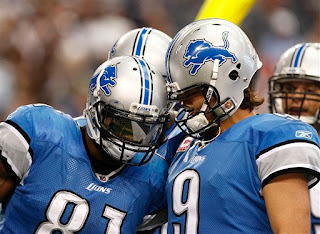 If you don’t see Delmas, you just have to listen for him. If you don’t hear him, he’s not likely around. This goes for on the field where his mouth is invaluable and in the locker room where it can sometimes be a little crazy but mostly in a good way. Oh, but when he’s injured he has nothing to say. 2. Willie Young is proving to be quite the loudmouth on the field. Nothing wrong with that, it fits his personality. 3. Nate Burleson comes in a distant third. He’s more reserved than the first two, but he also has plenty to say and isn’t shy about it. Safety Amari Spievey wants to shed the inconsistent label he earned last season. Here are three reasons he should be better this season. 1. This will be his first season at safety where he’s had an offseason to prepare. With last year’s NFL lockout there was no offseason work. In his rookie season he was moved from cornerback to safety after camp. It makes a huge difference. 2. He had never played safety before the Lions asked him to make the switch. It’s been a big adjustment but now he’s getting more comfortable. 3. Spievey started 15 games last year. Defensive coordinator Gunther Cunningham has faith in him because he’s seen the big plays that he is capable of. Now he just has to play that way all the time. 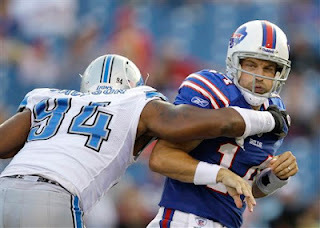 While nothing is set in stone, expect Stephen Tulloch, DeAndre Levy and Justin Durant to start at linebacker. That leaves an interesting mix for backups. Here are three backup linebackers to keep an eye on. 1. Doug Hogue is entering his second year as a bigger and wiser player. He actually grew nearly an inch and gained 15 pounds. And in his rookie season he was thrown right into training camp because there was no offseason due to the NFL lockout. He learned on the fly and feels more comfortable now and it shows. 2. Rookie Tahir Whitehead, a fifth-round pick out of Temple, has made an early impression. If he can play special teams and there’s no reason to doubt that he can, he’ll make the 53-man roster without a problem. 3. Ashlee Palmer has been working at middle linebacker in the offseason. He played there once last season — against the Giants — when there was a lack of healthy bodies. He’s solid on special teams. Can’t imagine they would let him go. Rookie Travis Lewis could be the odd man out unless they keep seven linebackers. Lewis could be assigned to the practice squad. It’s gotten to be kind of boring to hear it, but consistency has been key to the Lions’ turn-around so far. From 0-16 to the playoffs in three years is an impressive feat. Here are three reasons why consistency is key. 1. With coach Jim Schwartz, offensive coordinator Scott Linehan and defensive coordinator Gunther Cunningham all on the same page, it’s made life much easier for the veteran players. They know the offense or defense, heck they learned it three years ago. They have not had to reinvent the wheel each training camp. When they start camp, all the installation has been done. They can concentrate on execution and competition. 2. General manager Martin Mayhew and team president Tom Lewand work closely with Schwartz and the coordinators. They find the players that will fit the system. There is no mystery, the systems are in place. 3. This is a team that was mired in the depths of despair for so long. 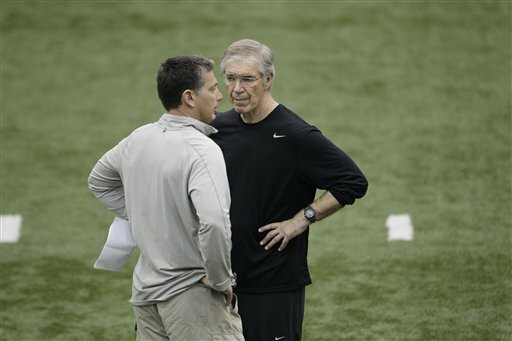 While Matt Millen was a constant for eight years, the coaches changed regularly. There was never a sense of direction from the top down. Now there is. Not only did the Lions draft seven players, but they’ve signed an assortment of undrafted rookies. 1. Offensive lineman Riley Reiff has been impressive as expected. Trouble is, the offensive line from last year returns. Reiff will undoubtedly be a starter in years to come at left tackle after Jeff Backus is done, but what about this year. Even though he’d only practiced at tackle (both sides) through OTAs and the minicamp, general manager Martin Mayhew thinks he could play guard too. It will be interesting to see how it shakes out. 2. Wide receiver Ryan Broyles is seven months out from ACL surgery and has said he’ll be ready for training camp. He’s working hard, but there is no guarantee that will happen. If he’s not ready to go he could start the season on the physically unable to perform list which would keep him out of the first six games. They’ve got plenty of wide receivers so there is no reason to push him before he’s ready. Again, he bears watching during training camp. 3. Albion’s Chris Greenwood was a fifth-round pick and despite his small college background seemed to fit in during the offseason. The 6-foot-1 cornerback is more than a project. He’s not going to start — that will be Chris Houston and Aaron Berry — but he could find a role on special teams and work himself onto the roster. No Lions today, it’s a good day to celebrate our country and our freedom. 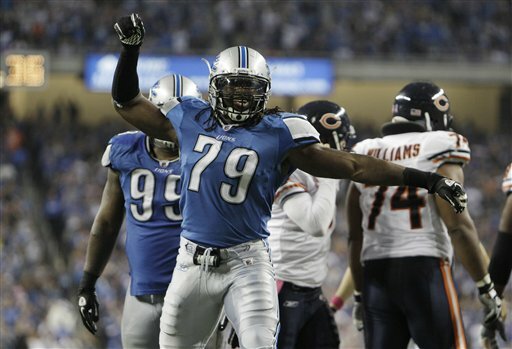 Willie Young is an outgoing, affable Lions’ defensive end who has made a believer of most everyone. Still, he is not always in the conversation when talking about the talented defensive line. Here are three reasons Young is overlooked as he enters his third season in Detroit. 1. He is not a starter. Cliff Avril and Kyle Vanden Bosch certainly get more notice and deservedly so since at this point they are better than Young. 2. It’s mysterious because Young is not overlooked by the coaches and management. 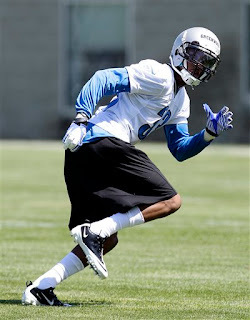 General manager Martin Mayhew said Young was one of three players who had caught his eye during OTAs and minicamp. 3. He was a seventh-round draft choice (North Carolina State). Had he been a first-rounder or even in the top four rounds this would all be different. The night of his draft, he was on a conference call from Florida with Detroit media members and it felt like he might jump out of the phone he was so excited. It’s hard to forget that because he still displays the same kind of excitement. On many NFL teams, Lawrence Jackson would be a starting defensive end. It could eventually happen with the Lions. A student of the game, he makes things happen when he’s on the field. Here are three reasons Jackson is overlooked. 1. He arrived with little or no fanfare. It was during training camp preparing for the 2010 season when he was dealt to Detroit from Seattle where he didn’t fit with Pete Carroll’s plans. Arriving in the middle of camp is no way to make a name for yourself. 2. The Lions defensive line is filled with personalities and big names like Ndamukong Suh, Kyle Vanden Bosch and Cliff Avril. Starters just naturally get more attention. Jackson, a former first-round draft pick out of USC, has played in 22 games over the last two seasons but has yet to start. 3. He’s quiet, smart and engaging. He certainly doesn’t chase the spotlight. Those who pay attention, know just how valuable Lawrence Jackson is to the Lions.